Audio systems that take advantage of Apple's new AirPlay feature to wirelessly stream music throughout your house are slowly starting to see the light of day. AirPlay, a feature that debuted with Apple’s iOS 4.2 and iTunes 10.1 updates, lets you stream music wirelessly—over your local Wi-Fi network—from your Mac or iOS device to compatible speaker and home-entertainment systems. The feature has been available since November, but aside from Apple's own Apple TV 2 and Airport Express units, systems that take advantage of AirPlay have been slow to emerge. The JBL On Air speaker dock was unveiled Monday. Harman International jumped into the market on Monday morning, providing a sneak peek at the JBL-branded On Air Wireless AirPlay speaker dock—a circular desktop speaker system—to fans of JBL's Facebook page, but provided no information on pricing and availability other than "Available this spring." Still, the promise of an AirPlay-compatible product is a step further than many manufacturers have gone. Here's a quick look at the state of AirPlay products: what's actually on the market, what's coming, and what might be on the horizon. Bowers & Wilkins (B&W): Bowers & Wilkins appears to have earned the distinction of First To Ship, as the company hit the market early with its Zeppelin Air, an AirPlay-enabled version of the original Zeppelin. The $600 audio system features five individually powered drivers for high-quality sound; it also sports a traditional dock-connector cradle for iPhones and iPods, as well as a USB connection for grabbing digital audio from a computer. The Zeppelin Air is available for purchase through the Apple Store. The Zeppelin Air is one of the few AirPlay-compatible systems actually on the market. Denon: Although Denon hasn't recently introduced any products that feature AirPlay, the the company is offering a $50 Airplay software upgrade that brings AirPlay support to five of the products in Denon's line of network-ready home audio systems: the RCD-N7 desktop audio system ($600) and the AVR-991 ($1000), AVR-3311CI ($1200), AVR-4311CI, and AVR-A100 "Anniversary Edition" ($2,500) receivers. (Audiophiles who stream music from their iPad or iPhone will also want to download the free Denon Remote App for room-to-room control of their music. Marantz: Denon's sister company, Marantz, is also offering a $50 AirPlay software upgrade that adds AirPlay capabilities to two of the company's network-ready components: the AV7005 receiver ($1,500) and the SR7005 receiver ($1,600). Two other AirPlay-compatible components, the $700 M-CR603 desktop audio system and the $800 NA7004 digital music server, will be available soon. A free remote app is also available for these products. In addition to the JBL On Air, noted above, these AirPlay-enabled products have also been announced. 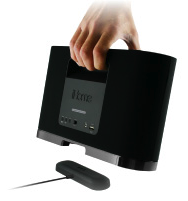 iHome's upcoming iW1 uses a small base to charge its internal battery. iHome: iHome made one of the splashiest AirPlay announcements, unveiling its forthcoming iW1 AirPlay wireless speaker system at January's Consumer Electronics Show. The price of the iW1, which features a rechargeable battery and an inductive charging base, is expected to be $299, and you can sign up on the iHome Website to be notified—and to receive an exclusive discount"—when the iW1 becomes available. House of Marley: House of Marley is also asking users to register for first dibs on its forthcoming One Foundation speaker system. The “eco-friendly” product will cost $500, but the company hasn't said when the One Foundation will hit the market. Klipsch: There's a (barely) more-definitive date from Klipsch, which in January announced its Klipsch Gallery line, which includes a trio of wireless audio systems: the Gallery Studio, Gallery Forum, and Gallery Arena. Although no pricing information is available, Klipsch promises to ship the new products in "spring or summer." Philips: Philips has just announced the Fidelio SoundSphere, a luxury (and luxury-priced, at €799) "lifestyle" system that combines a standalone iPhone/iPod dock cradle (adopted from the company's Fidelio line), excellent sound quality and free-floating tweeters (based on Philips' SoundSphere technology), and AirPlay functionality. The system will be available in Europe starting in May; no release date has been announced for the U.S..
Pioneer: This week, Pioneer Electronics announced its new consumer AV receivers, and the top-of-the-consumer-line, $550 VSX-1021-K receiver will include AirPlay support when it debuts in early April. In addition to playing music, the VSX-1021-K will also be able to display song info and cover art on your connected TV. The company says it will release eight AirPlay-compatible AV receivers in 2011, most in its Elite receiver line. Photofast: Finally, also reportedly on the horizon is an AirPlay-compatible system for your car from PhotoFast. The company hasn't released details of the product in the United States, but a number of tech blogs reported on the proposed AP1000 system back in November. Sadly—for those of us excited by the idea of a reliable, high-quality way to get our iOS audio into our car stereo without messy cables—links to PhotoFast's product page, as well as to a YouTube video demonstrating the product, have since disappeared. That might not be too surprising, though—when it comes to AirPlay, there appear to be more ghosts than actual products ready for consumers to buy. Macworld editors Dan Frakes and Jonathan Seff contributed to this article.